The earliest memories of what would be my childhood home growing up are of playing shop in the front room, my wares spread out over an old chest. Looking over the room I can see a piano and book cases and a sewing machine and a lovely roll top desk. And there's papers and bags of things and ornaments spilling out from every corner. Or memories of sat with my legs under the coffee table, some woolly cardigan on, eating cheese and carrot, watching Seasame Street having come home from playschool. I know that I noticed when we went to friends houses for tea that they didn't have art on all the walls, and their houses had playrooms so toys and craft materials didn't appear in every room all over the place. And they had large swathes of carpet for running on. As I grew up, I noticed that other people didn't have mounds and mounds of books everywhere, that other people didn't have cases and cases of dressing up clothes and a cupboard under the stairs that could give up a perfect sparkly ribbon or pearlescent paint for a craft project. As a teenager, I noticed some people's homes didn't actually feel homely. As an adult, I notice that other people don't have 1.5 walls of their spare room devoted to bookcases, and manage to put things away. And be tidy. So, I am my parent's daughter. I delight in art and colour and clutter. Fortunately I am strict enough to tidy somethings away. As I've blogged before, I am what I am because of these experiences. 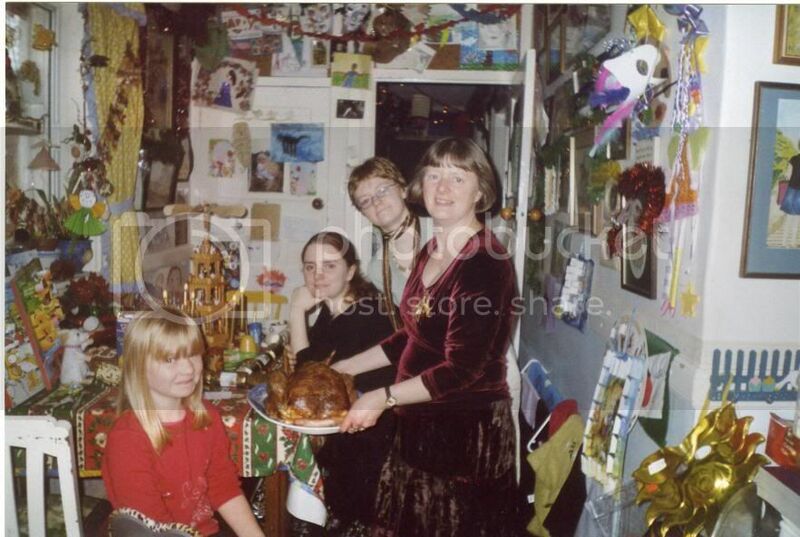 I can't find it now, but on an older blog post, I had a picture of my family at Christmas dinner and you can see the swirly whirl of colours and posters and art that made me.